We maintain our own private seed nursery, from which we hand select and grade panicles of rice (the cluster of grains on an individual stalk). In the ensuing season, these grains are planted in dedicated rows. Our half-acre seed plot, which contains over a thousand rows, is monitored for uniformity. If a row from a panicle shows any undesirable trait, it is removed. In the third year, the rice harvested from the seed plot is planted in a 10 to 20 acre plot. In the fourth year, the seed is flown onto a larger seed field. In the fifth year, the seed is used to produce the rice that is processed for consumers. We ensure each variety remains pure by geographically isolating seed plots and growing fields and thoroughly cleaning all field machinery (tractors, combines, trucks and planes). Purity and quality control continues in our on-site drying and milling processes. Prior to receiving rice at one of our two dryers, the entire facility — receiving areas, conveyor equipment, drying stands, and storage tanks are made immaculate. The milling equipment receives the same treatment. Additionally, this laborious process is repeated whenever we switch from Kokuho Rose to Sho-Chiku-Bai Sweet Rice and back. We monitor all factors that impact the finished product during milling. Although the U.S.D.A. Number 1 standard for rice allows 4% broken kernels, Kokuho Rose and Sho-Chiku-Bai Sweet Rice typically average less than 2% broken kernels. This standard, set by Keisaburo Koda, originated in the commitment that customers paying for whole grain kernels should get exactly that. Our on-site packaging lines are thoroughly cleaned on a regular schedule to maintain the purity of the finished products. We do not co-pack or private label for third parties. In the spring, ground preparation commences. Tractors tow steel discs to loosen and aerate the soil, then a succession of rigs until a fine and level seedbed is achieved. Levees are pulled up to delineate the borders of rice paddies within the field. To control the flow of water from one paddy to the next, a wooden box is placed in each levee. Ditches are pulled to deliver water quickly and efficiently. Flooding of the rice fields begins by mid-April. Our farm is located in an area where the soil type is classified as "adobe." This is typically considered undesirable in agriculture because of its poor drainage properties. However, for rice cultivation, this characteristic reduces water usage. Before a field is completely flooded, rice seed is prepped. The paddy rice soaks in water for 24 hours, and then drains for 24 hours, increasing the weight of the seed and stimulating germination. The heavy seed will now sink when sown onto the field by airplanes. 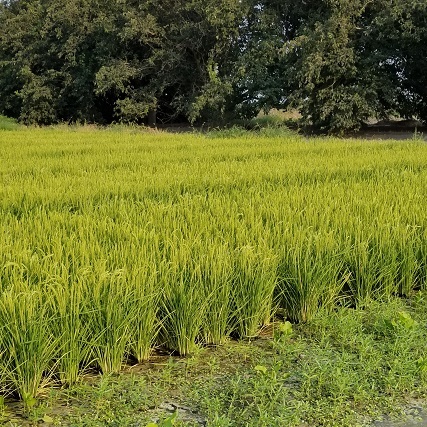 (Unlike the majority of rice growers who purchase their seed from outside sources, we operate our own in-house seed program to maintain the integrity of our proprietary strains and evaluate new varieties.) Come mid-summer, fields are lush and verdant green. By late July, heads of rice begin to emerge from the plant. Each head, or panicle, is comprised of many potential grains of rice which flower and self-pollinate. Weeks later, after the kernels within the husks mature, fields are slowly drained. With continued warm weather, the rice dries and the soil firms up sufficiently to support heavy harvesting combines. Starting early to mid - September, combines slowly cut the rice, thresh the stalks, and segregate the grain. Rice is stored internally, while straw and debris are discarded from the rear. When storage capacity is full, a "bankout" wagon comes along side in the field to receive the paddy rice. This is off-loaded to roadside trucks that deliver the paddy rice to the farm. Harvesting is dependent on dry weather and may last into early November. Final fieldwork entails dealing with the residue rice straw. This is shredded and worked back into the land or baled. Lastly, tractors towing plows turn over the rice stubble in preparation for the next growing cycle. Newly harvested paddy rice makes its way to our farm headquarters where upon arrival, weight is recorded. Grain is delivered to dedicated dryers – one for Kokuho Rose®, and the other for Sho-Chiku-Bai ®. Paddy rice rides up elevators and gravity flows downward through columns of hot air over baffled plates. Once dried to the proper moisture, it is stored in silos until needed. In the mill, paddy rice passes through specialized machinery in multiple stages. After the papery outer husk is stripped off, kernels are conveyed through a series of abrasive tumblers that remove the bran and expose the white grain. Whole kernel rice is packaged into various package sizes under our brands and then carefully stored until its departure from the farm. An inevitable byproduct of the above steps is broken kernels. We process these "second head" kernels into rice flour. Milled flour from Kokuho Rose and Sho-Chiku-Bai are packaged respectively as Diamond K® Rice Flour and Blue Star® Mochiko Sweet Rice Flour. Our Certified Organic Farming Practices conform to demanding guidelines set by CCOF, California Certified Organic Farmers. Founded in 1973, non-profit CCOF was one of the first organizations to perform organic certification in North America. Today, the CCOF seal is synonymous with integrity and high standards. Our positive environmental goals are achieved by following sound farming practices that care for the land and add vital habitat to the San Joaquin Valley. We strive to nurture our land in a manner respectful of its multi-cultural history and rich biodiversity. Our products are certified kosher by KSA, Kosher Supervision of America. The following description is from their site, ksakosher.com "… Kosher Supervision of America is a not-for-profit Kashrus certification agency recognized by rabbinical associations throughout the world. KSA is the largest, recognized and accepted, Orthodox kosher certification agency based in the western United States… "
We hereby certify that Koda Farms rice products, Heirloom Kokuho Rose® Japanese Style Rice, Sho-Chiku-Bai® Sweet Rice, Blue Star® Mochiko Sweet Rice Flour, Diamond K® Rice Flour, and Kokuho Rose® Rice Flour are free of Genetically Modified Organisms (GMO). Koda Farms rice products are farmed, milled, and packaged in California, USA. We maintain our own seed nurseries, enabling us to verify the source and purity of our select seed. Our proprietary, heirloom Kokuho Rose® and Sho-Chiku-Bai® Sweet Rice strains were developed in our on-site breeding nurseries in the 1940s – 1950s through traditional breeding practices, without the use of genetic modification techniques. Additionally, we've gone the extra mile and now all our Koda Farms products are NON-GMO Project Verified. Visit their website for all our product listings. Koda Farms is a certified organic facility, indicating that operating procedures and practices are above and beyond conventional standards as mandated by the USDA. We hereby certify that Koda Farms rice products, heirloom Kokuho Rose® brand Japanese style rice, Sho-Chiku-Bai® brand Japanese Sweet Rice, Blue Star® Mochiko Sweet Rice Flour, Diamond K® Rice Flour, and Kokuho Rose® Rice Flour are free of the substances listed below and gluten-free. Our flour mill is dedicated exclusively to the production of rice flour – we do not toll-mill or co-pack for outside entities. *Footnote: California alone, is the sole state in the US to have banned the cultivation of GMO rice varieties.